Best known for its ability to transform simmering pots of sugared fruit into marmalades and jams, pectin is a major constituent of plant cell walls and the middle lamella, the sticky layer that glues neighboring plant cells together. Pectin imparts strength and elasticity to the plant and forms a protective barrier against the environment. Several different kinds of pectic compounds combine to form pectin. The relative proportion of each of these depends on the plant species, location within the plant, and environment. Pectic compounds decorated with β-1,4-galactan (a chain of six-carbon sugars) are of considerable interest to the biofuels industry, because six-carbon sugars are readily converted into ethanol (biofuel) by fermenting microorganisms. A new study published in The Plant Cell reveals a novel enzyme involved in the production of β-1,4-galactans. This enzyme may be used to engineer plants with more desirable attributes for conversion to biofuel. The major enzymes that catalyze pectin production are hard to pin down. 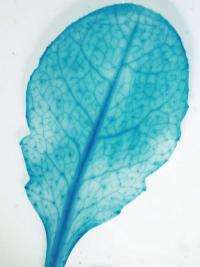 Close to 70 enzymes are predicted to underlie pectin synthesis in plants; only about three of these have been identified definitively. Knowledge of these enzymes could be used to boost the production of pectins with desirable characteristics. A team of researchers at the Joint BioEnergy Institute, University of California, Berkeley, and Technical University of Denmark set out to identify the enzymes that catalyze the production of β-1,4-galactan. They screened a database of enzymes for galactosyltransferases, the enzymes that link six-carbon galactose sugars into a chain. They found a family of proteins, named GT92, that are present in some animals and all plants sequenced to date. 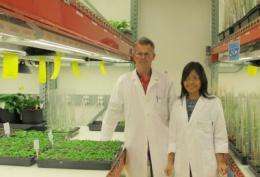 The authors found that mutations in each of the three genes encoding the GT92 proteins in the model plant Arabidopsis led to a reduction in β-1,4-galactan, whereas producing more of one of these proteins led to a 50% increase in β-1,4-galactan levels. In many cases, modifying the composition of plant cell wall components leads to alterations in growth or stature. Strikingly, all of the plant lines overproducing this important six-carbon sugar appeared to be healthy. Biochemical tests of the enzymatic properties of purified Arabidopsis GT92 protein supported the hypothesis that GT92 proteins are important enzymes for β-1,4-galactan synthesis in plants. This means that crops engineered to produce increased levels of GT92 proteins might contain more easily fermentable sugars, thereby potentially boosting the efficiency of biofuel production. According to lead scientist Henrik Scheller, "Bioenergy crops with high β-1,4-galactan content would have significant advantages for the biofuels industry and we now have the knowledge to specifically increase β-1,4-galactan content in the biomass of cell walls. This breakthrough was made possible by a collaboration involving members of the Feedstocks Division at JBEI and our collaborators in Denmark. We are very excited about this result and look forward to testing it in a bioenergy crop such as switchgrass or poplar trees". Simply applying the rubric "for use as a biofuel feedstock" doesn't lessen the danger inherent in introducing these novel GMO organisms into the environment. But there's money to be made, so damn the consequences.